Yes, I've always been opposed to a re-run of the referendum because that would simply sow divisions and uncertainty even more deeply and, as you say, further undermine democracy. 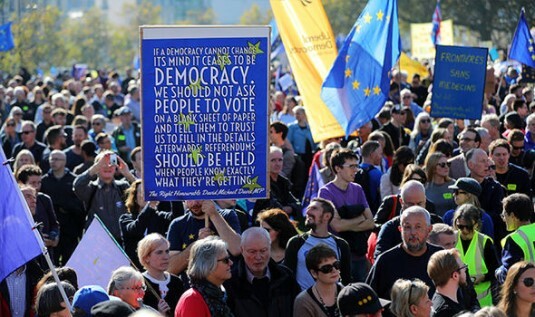 However, clearly, the people marching were anti-Brexit not really for a new referendum - within that context I supported them. But the "people's vote" schtick has always seemed a misnomer for the reasons you mention. Incidentally, I DO think another referendum is possible if May implodes - a deal or no deal. I do however dispute your position on Labour. Labour could stand squarely for a properly "Norwegian" position and campaign for an election on this basis - perhaps I have missed this, but then I am confused as everybody by what they stand for. That would square this particular circle. Instead, honestly I have no idea what they want (customs union? Maybe. Single market? Maybe) but they have been mute, to say the least, and clearly this is a result of the Lexit supporting leadership. At the UK's time of crisis, they have genuinely failed to show any effective opposition, which is why May, for lawd's sake, still ranks higher in the polls than Corbyn as a leader. I repeat, Labour COULD HAVE come out and strongly advocated at least Norway, which would have been consistent with the vote but still done least damage/ even benefited the UK. But they showed at best timidity and at worst connivance in this car crash, and that, my son, is down to dreadful leadership. They are a kind of mirror image of the Tories, with a party being headed by ideologically blinkered Brexiters and a body pro-EU. When the history of this national disaster is written, I'm afraid Labour will have a substantial dishonourable mention. I was wrong. It was Chuka's second demo. He went on that Board of Deputies one in April. You have framed your argument in terms of what is in the immediate material interest of Britain, or you might argue from there the British working-class. That in itself is a nationalist rather than socialist perspective. The real argument is about what is in the longer term interest of the working-class as a global class, and in the specific case here, the EU working-class. To use the parallel you have used, the Scottish referendum, the question you should have asked is what would have been the consequence of a Yes vote. It would have split the Scottish working-class from the rest of the UK working-class; it would have sowed the illusion in workers heads that the solution to their problems is nationalism rather than socialism – thereby legitimising the ideas of nationalists like UKIP/BNP et al. It would have weakened Scottish workers, and also weakened British workers. The immediate effect would have been that a competition for a drive to the bottom on wages and conditions would be put in place between Scotland and the rest of Britain, as Scotland attempted to attract capital to Scotland away from the rest of Britain, especially, as it would then attempt to sell its output into the UK economy, which would then have led to further downward pressure on UK wages and conditions. As Marx explains in Capital III, in a given economy, larger capitals with a higher organic composition benefit relative to smaller capitals, where there is a general rise in wages, because the rise in the former's costs is less than the fall in the average profit, so that their rate of profit rises, causing additional capital to flow into that sphere, and away from the smaller capitals. But, that relates to a situation of a given economy, where there is this general rise in wages. Where a separate economy is established, and incentives for lower wages are created, the capitals in this separate economy can sell into the other economy at the prices predominating there, whilst paying lower wages, thus setting in train, a downward spiral. No. As socialists we always place the struggle for Socialism above bourgeois democracy, and the interests of the working-class above compliance with bourgeois democracy. Winning the battle of democracy does not mean adopting a position democratic primitivism, but quite the opposite of refusing to simply accept the current majority bourgeois consensus, and relentlessly struggling to win a majority of society to the ideas of Socialism! We are precisely in the business of ignoring votes when the consequence is to impose a cost upon the working-class, which is what we do every time a Tory government is elected, and why that causes us to try to get that government out of office, and toc all for another vote. It is why we refused to accept the Poll Tax, or the anti-union laws, despite the fact that Thatcher had won a bourgeois democratic vote to implement those policies. Your distinction between “internationalised” and “internationalist” fractions of capital seems contrived. The fact is that these sections are internationalist in outlook, because they are internationalised, whereas the market trader, the white van man, or back street garage owner etc. is not. And, precisely because of that they are more progressive in outlook than are the latter, and their political representatives such as Bojo, Mogg et al. In relation to the effects of the drive for shareholder value, and so on that ignores the objective reality of the underlying nature of the real capital, as socialised capital, and the potential it presents even just for progressive social-democracy, as the impending financial crash imposes itself, and the power of those shareholders is thereby diminished. In the 1970's, it led to Wilson setting up the Bullock Commission on Industrial Democracy, which took up the ideas of co-determination as already existed in Germany, and the EU drew up its Draft Fifth Company Law Directive, on industrial democracy to have 50% of supervisory boards elected by workers. Marxists would want to go beyond that, but even such measures of progressive social-democracy, are only possible because of the existence of these large socialised capitals, and only feasible on an EU wide scale. As for the leadership of the anti-Brexit movement, what you are arguing is a self fulfilling prophecy. The current leadership is people who we don't like, so don't oppose Brexit! The current leadership is people we don't like, precisely because for the last two years, the labour Leadership has abrogated its responsibility to lead, and has thereby allowed these other elements to put itself at the head of a popular movement that socialists should have been leading from the start! Its rather like the sectarians, who wouldn't join Labour, because they didn't like Blair, and who thereby stood aside from the struggle against Blair, only being prepared to dirty their hands, by joining Labour, when others had done the job for them, and Corbyn was elected leader. I don't understand this comment. 70% of the support for Brexit comes from Tories, not 70% of Remain. The vast bulk of the anti-Brexit vote, probably around 80%, comes from Corbyn supporting Labour, which s why its bizarre that any Corbyn supporters, are hitching their wagon to the Tories, and more particularly the paleo-Tories such as Mogg. Stopping Brexit is within Labour's gift, just as stopping the Poll Tax was in Labour's gift. Its what providing political leadership is all about, particularly for a Corbynite Labour party that prides itself on supposedly building an extra parliamentary social movement! Where has been any of that extra parliamentary mobilisation. Instead Labour has tailed the Tory Right at every stage of the parliamentary process! In the early 19th century, the bourgeoisie sought to translate its economic and social status into political representation. Its often forgotten that the Peterloo Massacre, occurred as the old landed aristocracy sent in the dragoons to mow down, men, women and children demanding the basic bourgeois democratic right to vote. Industrialists like the Pottery manufacturer John Ridgway were among that crowd demanding bourgeois democratic rights. It included, however, necessarily a majority of urban workers, who also saw the spread of those democratic rights being in their interest too. The fact that the crowds who initially rallied at St. Peter's Fields did so under purely bourgeois leadership, for a programme of purely bourgeois-democratic rights, did not prevent Marx from recognising the progressive nature of that struggle, and supporting the workers in lining up alongside their capitalist exploiters in that fight. He recognised that it also created the basis for the workers themselves going beyond it, with the creation of the People's Charter. before my comment that “I don't understand this comment”. Democracy is merely a means to an end, not the end itself, still less limiting ourselves to the limitations of bourgeois democracy, of which referenda, the favoured tool of the Bonapartist, are from being the best example. Our task is to preserve rights, not democracy. Democracy is one potential means of preserving or advancing rights. That is all. But, there is also such a thing as the tyranny of democracy, which the above dictum describes. If a BNP or other fascist government came to power, and held a referendum to gain democratic approval to send all Jews and Muslim to the gas chamber, for example, would you propose that we must refuse to ignore this vote, and do all in our power to prevent its implementation, along with doing everything in our power to remove those fascists from government? Our task is to promote the rights of the working-class, as part of the basis of facilitating the class struggle, and thereby replacing the rule of capital by the rule of the working-class. The fight to promote those rights surpasses any concern with purely democratic votes, or any other simply bourgeois democratic freedoms. As Lenin put it. I don’t think this is quite true, in Scotland the SNP all but wiped out the other main parties in the 2015 GE following the independence referendum and I think that in the UK Brexit has the potential to very much muddy the waters as far as a potential Labour government is concerned. Instead of it being a straight up battle between the Tory’s and Labour fighting it out on the Tory record of the last 8 years (in England and Wales at least), Brexit has added another dimension that didn’t exist before which can be seen clearly in Labours triangulation as it avoids antagonising it’s “Leave” voters. ... and how, Phil, would you describe 'left' supporters of Brexit? "Brexit has added another dimension that didn’t exist before which can be seen clearly in Labours triangulation as it avoids antagonising it’s “Leave” voters." But, it doesn't. Of Labour's 2017 voters, only about 20% voted for, or support Leave. Even in places like Stoke, and the other Northern constituencies, where there is supposedly this large number of Labour Leave voters, around 60-70% of Labour voters in 2017, support Remain. Those promoting Brexit have done a good job of confusing and muddying the waters, by pointing to the proportion of the total electorates in those constituencies that voted Leave, whilst failing to point out that although Labour may have won these seats, they were not the only party standing in them. The fact is that in these Northern Constituencies, the Tory/UKIP vote voted solidly for Leave, along with some of those atomised, backward layers who generally do not vote at all. That is what skewed th result in those seats, not any great support for Leave from actual core Labour voters. Labour candidates thinking that they are going to gain votes by backing Leave, or failing to oppose Brexit, or that they might lose votes from Leave voters by standing out against Brexit, are totally mistaken. Brexit is the hot potato no one wants on their hands. The Tories are playing both ends off against the middle to make it seem that whichever side wins, or perhaps which ever side doesn't win, they can pretend they were for both sides. Clever, if cynical, but that's politics. We've had nearly two generations of neoliberal economics which have turned back the clock on workers rights, social mobility and wage rises for the majority, the chronic lack of affordable housing, the dearth of representative democracy, the increasing 'pantomimation' of binary politics, a propagandised media and cuts for all kinds of essential services and overpriced necessities like gas, electricity and public transport. Brexit is merely the symptom of much deeper problems in British society. We all know we are being lied to, that wealth is overriding justice and corruption and chicanery are now just 'business as usual'. All the talk is cheap. The left either accepts class and economics are tied together, or they continue to be a middle class dominated wing going nowhere very slowly. "Stopping Brexit is within Labour's gift, just as stopping the Poll Tax was in Labour's gift." Brexit was the choice of a large majority in many safe Labour seats. This comparison is simply bizarre. ii) Places full of students and/or ethnic minorities which are virtually certain to vote Labour regardless of the party's position on Brexit. "That's not the problem Jason: the real problem is that most of the Tory-Labour marginals (ie the seats which decide General Elections) voted heavily Leave." "Brexit was the choice of a large majority in many safe Labour seats. This comparison is simply bizarre." Except it wasn't. In safe Labour constituencies, nowhere was the vote in favour of Leave more than around 60%, as against 40% Remain. But, that is 60% of the total vote. That total vote is made up of people who a) vote Labour, b) Vote Tory, c) Vote Liberal, d) Vote Ukip e) Vote for some other smaller party f) Usually do not Vote. The vast majority of the Leave vote, everywhere, including in those safe Labour seats, was comprised of people who a) Vote Tory, b) Vote UKIP/BNP or some other right-wing outfit, c) generally do not vote. The vast majority of the Remain Vote, including in those safe Labour seats was from Labour Voters, Liberals, Greens, which is why John Curtice's analysis shows that in those safe Labour seats, around 60% of Labour's 2015 vote, was people who voted remain. The proportion of its 2017, voters who voted Remain is even larger, because in 2017, more younger voters, who support Remain by around 80% to 20%, were mobilised to vote Labour. In addition, a large number of Green and Liberal voters who voted remain, switched to Labour, because they realised it was the only hope of stopping a hard Brexit, and because they held out the hope that Labour would oppose Brexit itself. Some of them were amongst the hundreds of thousands who joined Labour. Labour's current stance risks losing them overnight, and fuelling a resurgence of Blairism/Liberals. In addition, as Kensingington, Canterbury et al, showed, as well as these Liberals and Greens, even some pro-Remain Tories must have switched to Labour, and again, they will go. If Labour continues on this course, not only will it lose all these progressive young voters and activists, it will risk perpetrating a class betrayal on the scale of 1931, by essentially forming a National Government with May, to push through a reactionary policy.